Spybot 2 Technician Edition portable has been designed for single support case handling. It combines all our tools including anti virus protection into one package for the technician user. With our Technician Edition you can be proactive by scheduling immunization of your system or run an automated scan for malware and rootkits. Updates can also be automated so they are no longer a cause for concern. With our ‘Startup Tools’ you can check various ’autostart’ locations for entries that might impact on speed or security. Spybot 2 comes with its own whitelist which helps to identify if files are legitimate or not. This useful addition helps to speed up the scan. The supported ‘command line parameters’ will help you to tailor the level of automation you require. Users of the Technician Edition also get high priority email support. Finally Spybot 2 Technician Edition comes with additional more powerful tools. The Protected Repair Environment© allows you to to scan and fix machines already infected with very aggressive malware that might stop security software from working. 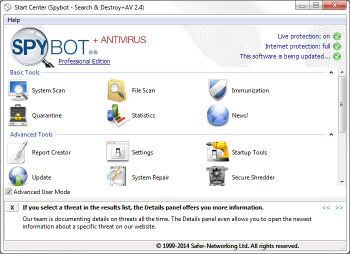 If all access to an infected machine has been lost, due to a malware infection, the Spybot Boot CD Creator will guide you through creating a Spybot 2 liveCD on a another PC. This powerful tool allows you to do a ‘clean boot’ of your system and then scan in ‘offline’ mode.